The villain is back. In his 2010 drama Raavan, Mani Ratnam tried to blur the lines between the hero and the villain. Anubhav Sinha’s Ra.One (a feeble attempt at disguising reference to the mythological demon king), had a child who thought the villain is cooler than the hero. Ravana seems to have suddenly caught the fancy of film-makers, writers and artistes. The latest attempt to retell Valmiki’s epic mythological tale from its antagonist’s point-of-view is by New Delhi-based Oriya writer Vijayendra Mohanty and Mumbai-based graphic artist Vivek Goel. And the duo’s graphic novel Ravanayan, a 10-part series retelling the Ramayana from Ravana’s perspective, is already creating waves. The fourth issue of the 10-part series will hit the shelves this month and there is a gap of six weeks between issues. It’s published by Holy Cow Entertainment, owned by Vivek. Ravanayan is an “imaginative” take on the life of Ravana. Thanks to simplistic versions of the Ramayana, Mohanty says, when an Indian thinks about Ravana today, he thinks ‘villain’. Hence, the creators intended to reinvent Ravana. With Ravanayan, their attempt was to show that the world is a complex place and everyone has reasons for doing things they do. “Indians have read mythological stories in the form of Amar Chitra Katha for a long time, and generations have grown up reading those tales. We wanted to do something offbeat in mythology, and many people found our concept intriguing. We are not trying to make a divine comparison between Ravana and Ram. The series depicts the psyche and making of Ravana, something we haven’t read before. The point is that they are not so different, yet they make different choices,” says Mohanty, who started work on Ravanayan back in 2009. While working together in New Delhi, the duo initially hit upon the idea of a graphic novel on Duryodhana, but settled on Ravana since he had more ‘mass appeal’. Since then, they have been busy recreating mythology. Ravana is remembered for the wrongs he committed, and they are not changing the story. “We merely go behind the scenes and take an imaginative approach to explaining his reasons for doing the things he did,” he says. Story apart, physical appearances of most of the characters too, have been re-imagined in the graphic novel. Ravana is depicted as a handsome young man with flowing locks of white hair, while Ram dons a shabby, unkempt look. “White represents elegance and royalty. Our Ravana is clean-shaven, without the clich&eacute;d moustache,” says artist Vivek. He reasons out Ram’s look by saying that as forest dwellers, Ram couldn’t have shaved daily. Even characters like Brahma, Vishnu, Shiva and Narad have been given a new avatar. So far, the response to Ravanayan has been very enthusiastic. At `50-100, it’s the single-largest selling Indian graphic novel series on Flipkart today. “So far, of the hundreds of feedback messages we have received, only one or two can be called negative. Many picked up a copy just because they thought the concept was intriguing,” says Mohanty. Interestingly, till date, the authors haven’t spent a single paisa on marketing the books. “It all happened by itself, thanks to the viral nature of things on Facebook. Word spread quickly, and far. 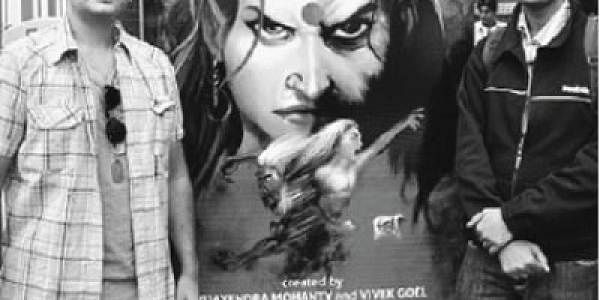 Ravanayan had a sizeable base of potential readers even before the first draft of the script was ready,” says Goel. The credit for most of the buzz can be given to some early concept sketches that they shared for free online. Post-launch, Twitter guided a lot of people to the official website of Holy Cow Entertainment, and the buzz spread farther. “Word-of-mouth is a primary driver of book sales. Social media provides us a priceless set of tools to help maximise possibilities,” feels Mohanty. For both creators, the making of a comic book is an epic tale of compromises. As a writer, creative decisions of Mohanty had to be factored in his partner Vivek’s strengths and choice of style. The objective was to keep it as seamless as possible, but a comic book required the collaborators to adapt and adjust, not only with the work flow but also to each other, Mohanty says. Mohanty lives in New Delhi and works from home. Goel lives in Mumbai. “We share notes and information by email, and have frequent, sometimes heated, discussions on the phone. We use various Net-based file-sharing and collaboration tools,” he adds. Both Mohanty and Vivek have been constantly changing their plans regarding Ravanayan since they began publishing it. Reader feedback indicated that though people loved the issues, they find themselves let down by the small number of pages. This is understandable, since the 16 page issues never give reading experience a chance to mature. “We have made some changes to our publishing schedule. Ravanayan will no longer come out in single chapter issues. We are packing two chapters into each issue from now on. This means the series will wind up earlier than estimated. At the rate we are going, Ravanayan readers should get a magnificent finale sometime in the second half of 2012,” says Mohanty.